Wow – 2012 has begun! Our New Year resolutions may be focusing around exercising. Eating more vegetables. Yes, even house cleaning. 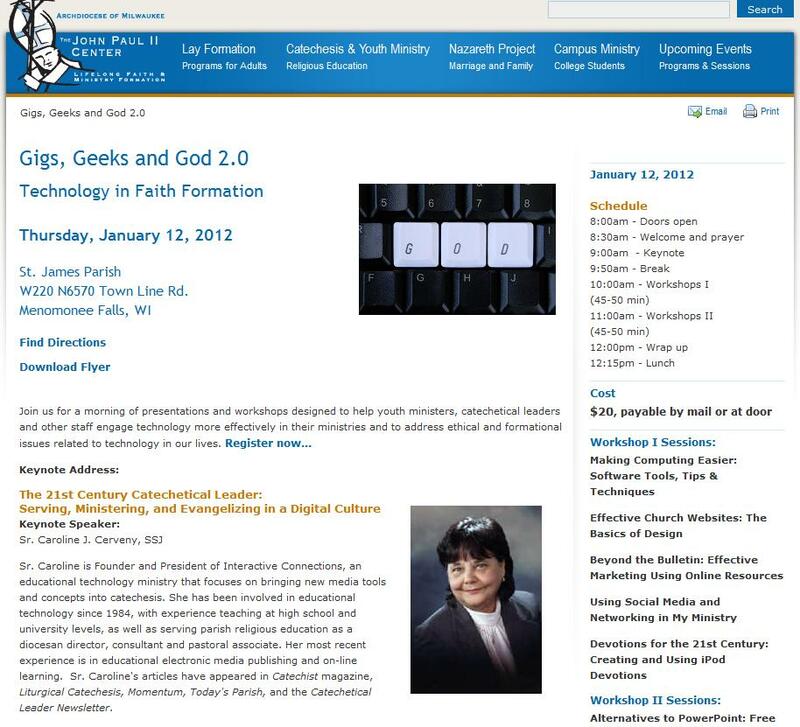 But there are some who are beginning the year via Gigs, Geeks, and God 2.0: Technology in Faith Formation. I shared my thoughts about The 21st Century Catechetical Leader: Serving, Ministering, and Evangelizing in a Digital Culture today. Yes, it is a challenge to be a 21st century leader! Digital skills are needed. Many of us were not raised with computers or any other digital tool. Often we may feel like a fish trying to swim in unfamiliar waters. Yet, swim we must! I love being on the other side of the camera. Many folks are unaware that I once was a wedding photographer for Edward Fox studios in Chicago. So today, I am on the other side of a webcam delivering a keynote at a Milwaukee technology day for Catechetical Leaders, Youth Ministers, and other Parish Staff. When I began my catechetical ministry, I never imagined that I would ever be able to do what I did today from another part of the USA (sunny Tampa) presenting to a group in Milwaukee. With the simple tools of a computer, webcam, mobile phone, and Internet connection while using GoToMeeting to connect with one another. It takes some practice to do digital presentations. Yet, the practice results in an event that not only saves money (travel, housing costs, and food), but we have the capability today to do what are called “blended” events. The blended event uses technology for a purpose and of course on-site face-to-face interaction in the program with others who are in the same geographic location and travel to the hosting location. What are the advantages of blended professional development events? Of course, you get to interact and hear others who are not in your part of the world. The disadvantages? Yes, I’m one that loves to see folks, interact with them, have coffee or a beverage with them, or just laugh with them. Well, even in the Digital presentation that is all possible. I’d encourage you to read the eLearning Advantages and Disadvantages article. Then come back to this blog to share your insights and learning about the potential of doing blended professional development. What possibilities do you see in your parish? deanery? diocese? Before the conference, go to the Gigs, Geeks, and God Facebook page to follow and participate in the pre-conversation. During the conference, using your mobile phone, Twitter your comments to those who are following you on your Twitter account. If you add a hashtag to your 140 character message – for this event use #gigsandgeeks as your hashtag. Why? Go to your Twitter page and at the search field enter in #gigsandgeeks. In a few seconds all tweets associated with this event will show. After the event, search for the conference Twitter Hashtag and/or go back to the Facebook page and/or respond to this blog. A participatory culture is a culture with relatively low barriers to artistic expression and civic engagement, strong support for creating and sharing one’s creations, and some type of informal mentorship whereby what is known by the most experienced is passed along to novices. A participatory culture is also one in which members believe their contributions matter, and feel some degree of social connection with one another (at the least they care what other people think about what they have created). 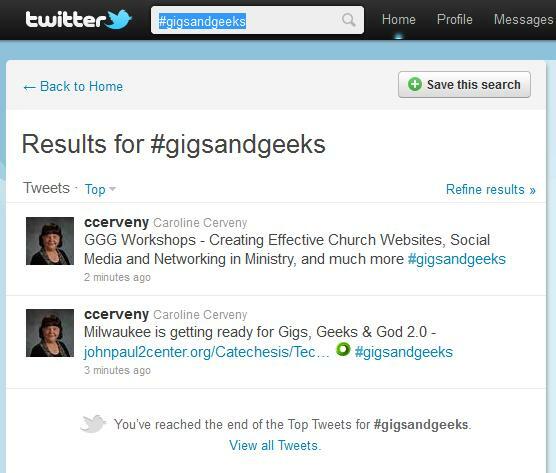 So a big congratulations to Milwaukee for their Gigs, Geeks and God 2.0 professional development day. Here’s an article by Gary Pokorny, CSA Supports Catholics Called To Pass On the Faith. Gary highlights what his office is doing and how Gigs, Geeks and God is related to it. It’s wonderful to see how a Diocesan Office is integrating technology into the training and development of their catechetical ministers. Do check out the Catechesis and Youth Ministry website. I so appreciate the Technology in Faith Formation page. One way to engage our catechetical leaders in the importance today of integrating technology into their ministry. Note: The following is a recorded version of today’s presentation. 21st Century Catechetical Leader: Serving, Ministering, and Evangelizing in a Digital Culture from Caroline Cerveny on Vimeo.